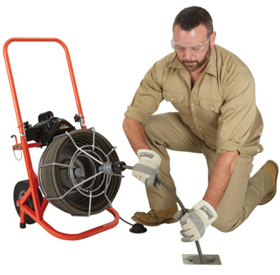 The Easy Rooter is a tough, easy-to-use machine. It has a rugged powder coated steel frame with special “roll bars” to protect the motor and heavy-duty roller bearings in the cage for longer life and greater motor efficiency on long runs. 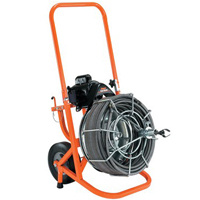 The large cage holds 100 feet of 3/4″ or 5/8″ Flexicore® cable to clear tree roots and other difficult obstructions in 3” to 10” drain lines. A Quick-Grip™ chuck secures the cable during operation. With a just a quarter turn, the chuck tightens firmly on the cable to secure it while the Easy Rooter drives the cable into the line. Then, can be released just as quickly to pull more cable from the drum. It’s faster and easier to use than a thumb screw. The Easy Rooter rolls smoothly on big 10″ ball bearing wheels mounted on a half inch reinforced axle. A built-in brake holds the machine securely on the job or in a customer’s car during transport. An extra-long folding handle quickly locks in place, making it much easier to wheel the Easy Rooter to the job, without sacrificing the compact size needed for easy loading in a car trunk. Power is supplied by a 1/3 hp capacitor motor with thermal overload protection. A momentary contact reverse switch protects the cable by preventing the operator from running the machine in reverse for more than a few seconds at a time. Motor: 1/3 hp heavy duty, capacitor start, thermal overload protection, Forward/Off/Momentary Contact Reverse Switch. Foot Pedal: Leaves operator‘s hands free to control cable. Uses air pressure, so there’s no electrical contact between pedal and motor. Power Cord: 20 ft. 3-wire vinyl covered with molded plug. Equipped with ground fault circuit interrupter. Wheels: 10″ Semi-pneumatic tires, with roller bearings. Cables: 3/4″ for 4-10″ lines; 5/8″ for 3-6″ lines. Cutter Set: Spear Head, 2″ U-Cutter, 3″ Heavy-Duty Side Cutter, 3″ Heavy-Duty Saw Blade and Large Retriever. Leather Gloves: With double-reinforced palm, for hand protection when guiding cable. A Quick-Grip™ chuck secures the cable during operation. With a just a quarter turn, the chuck tightens firmly on the cable. It’s faster and easier to use than a thumb screw. Handle folds down for more compact storage and to take less space in car trunk.